Ross-Nazzal describes a right to vote movement quite different than the generally accepted accounts, which imply a unified effort among women across the country. That was far from the truth, writes the historian who exposes the infighting and controversy within the movement in Washington. While pursuing the right for women to vote and run for office, DeVoe had several clashes including one with May Arkwright Hutton, a flamboyant and wealthy Spokanite. When the time came to go to the legislature, Hutton took the aggressive route, loudly demanding the state politicians pass a suffrage bill. At the same time DeVoe believed patience and an approach of being “good natured and cheerful” would differentiate Washington’s women from the radical and often marginalized protestors in England and back East. Despite the negative press brought on by Hutton and her supporters, the bill did pass. Still, the issue kindled a bitter struggle for control over the movement in Washington that lasted years. 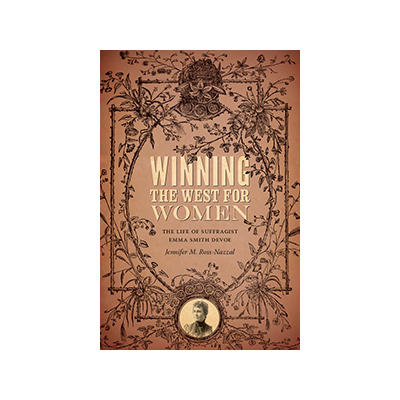 Nonetheless, the successes of the efforts in Washington and throughout the West revitalized the national movement, eventually leading to the passage of the 19th Amendment. No stranger to old documents and archives, Ross-Nazzal encountered challenges building the story. DeVoe’s childhood in Illinois had little record, no diaries, and very few personal letters. The local newspapers were often in tatters. Material came from DeVoe’s own accounts, written as brief biographies during the movement. One oft-told story of her youth, though likely a fiction of DeVoe’s own devising, frequently came up. When Susan B. Anthony visited DeVoe’s hometown and asked who would stand up for women’s rights, the only one who did was an eight-year-old Emma. It may not be true, but it does say a lot about DeVoe, notes Ross-Nazzal, that she sought to build her reputation by aligning with Anthony. Still, with materials from the Washington State Archives and a number of regional libraries, the author gives us a rich view of DeVoe as an organizer and activist. Ross-Nazzal has produced a clean narrative with telling details about the activists, their opponents, and the woman at the heart of the campaign for women’s suffrage in Washington.